Litchfield Resort offers extensive on-site facilities plus a wide range of quality accommodation in scenic locations including ocean, marsh and lake views. It’s full title is Litchfield Beach & Golf Resort which perfectly describes it’s main focus. You can stay on a golf course or on the ocean. Yet it is the range of other scenic locations which sets it apart from other resorts. There are a wide range of marsh and lake view properties offering spectacular views and plenty of wildlife. The main hotel facilities are set around a courtyard which is a great place to relax and consists the lobby where guests check in, Starbucks Coffee Shop, gift shop and day spa. Websters Restaurant and bar which includes an outdoor deck overlooking a lake to the back of the complex There is also a games room and an indoor pool and fitness room. Litchfield Resort has an extensive range of accommodation to choose from. Just behind the main complex is the first of the accommodation options. The large, one bedroom Summerhouse Suites which have a separate living area comprising lounge, dining area and full kitchen. The bedroom has two queen beds. The bathroom has a shower only, no tub. Just beyond this are the popular Seaside Inn 2 bedroom apartments. With two queen beds in each bedroom. Spacious lounge with dining area and balcony, separate kitchen, 2 bathrooms, 1 en-suite. There are also a wide range of 1, 2, 3 and 4 bedroom villas and condos. These are all privately owned so furnishings and bed arrangements vary. There are any number of unit types to choose from. Ocean front condos, marsh view and lake view villas are all located within the main resort. In addition, there are fairway villas at nearby Litchfield Country Club and River Club of Litchfield. Websters Restaurant and bar provides options for breakfast and dinner, while the on-site Starbucks offers an alternative and is open all day. 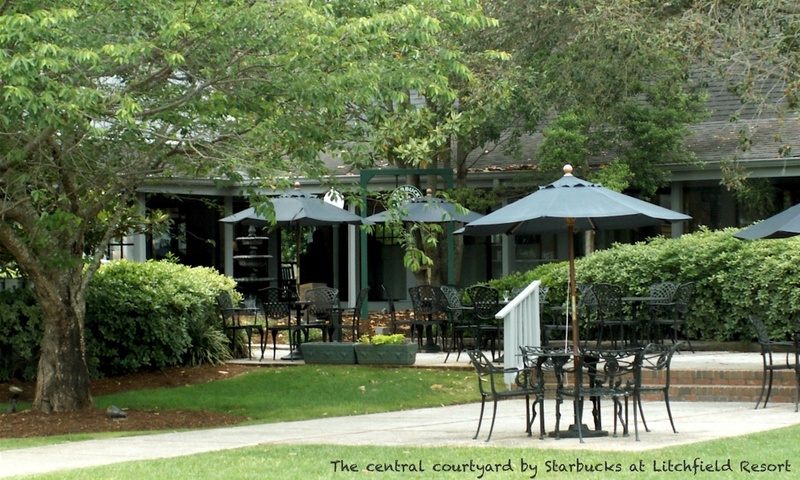 Litchfield Country Club has a daily buffet lunch as well as the standard fare in the golfers grill, plus they also do an excellent Sunday Brunch. Just across the street from the resort there are a handful of restaurants and bars which you can walk to including a couple of very good breakfast restaurants. There are numerous other dining options in the area within a ten minute drive including the waterfront restaurants at nearby Murrells Inlet. There are several local attractions close to the resort but the most popular is Brookgreen Gardens. This nationally rated gardens, wildlife exhibit and centre for American sculpture is just a couple of minutes away. Entry is very reasonable especially as it is a 7 day ticket so you don’t need to see it all in one visit. Find out more by visiting our Brookgreen Gardens page. Litchfield Country Club, Tradition Club, Willbrook Plantation and River Club are all within a short drive of the resort. The much heralded True Blue and Caledonia Golf & Fish Club, two of the highest ranked public golf courses in the US are located in Pawleys Island just a few minutes from Litchfield Resort. In addition, there are several other courses within a short drive of the resort including Pawleys Plantation, Blackmoor, Founders Club, Heritage Plantation, TPC of Myrtle Beach and Wachesaw East.